Outside under the Pomegranate Tree. Today is a sunny beautiful day and I was so excited to get outdoors and play with my new table and chairs. 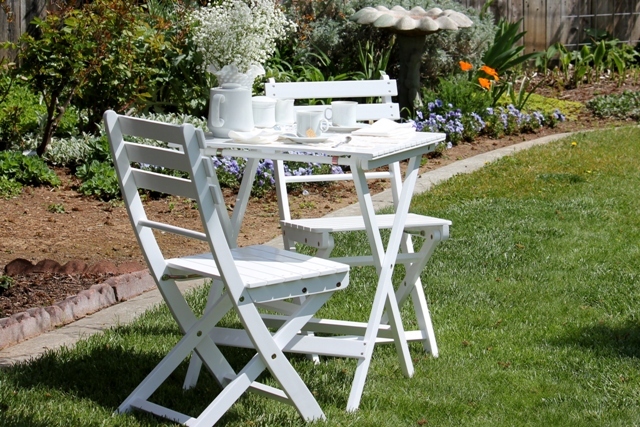 I have been looking for a small table and chairs to put on the lawn since last year. 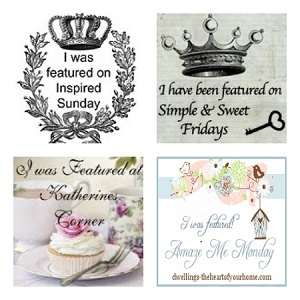 I was so inspired when I would see a darling table and chairs on a blog. 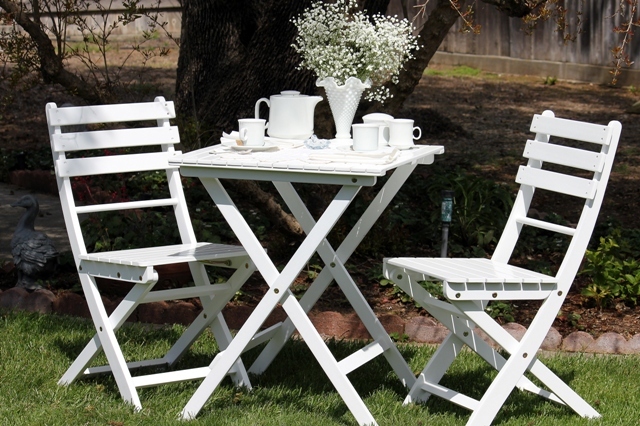 I just could think of a plethora of ideas for posts with just a little table and chairs outside. The Tea Cups, saucers, Tea Pot, sugar and creamer are Lynns Fine China which is my everyday dinnerware. I have had the complete set for twelve for over 20 years. The White milk glass vase was given to me by a friend that was downsizing her home because she was moving into a retirement facility. I bought the White baby's breath today at the market. 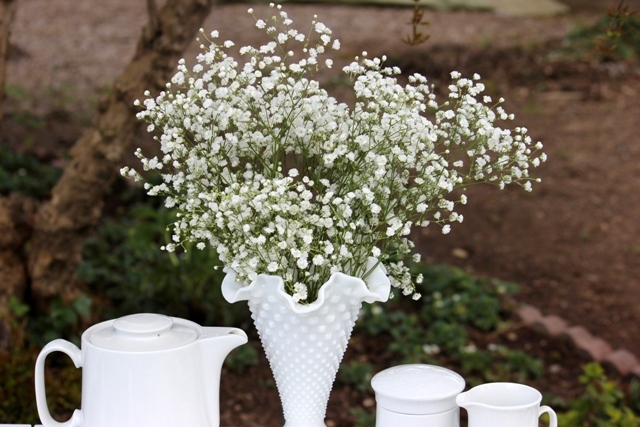 I love the look of the gentle sprays and the little puffs of White blossoms on the stems of the Baby's breath. The Vintage Dolly is just large enough for the tea set and still shows the detail of my little table. And Great-Grandmother's silver spoons to stir the tea. 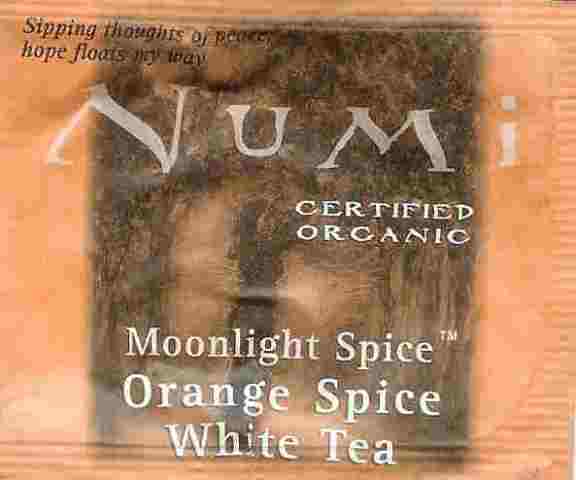 And some yummy White Tea. 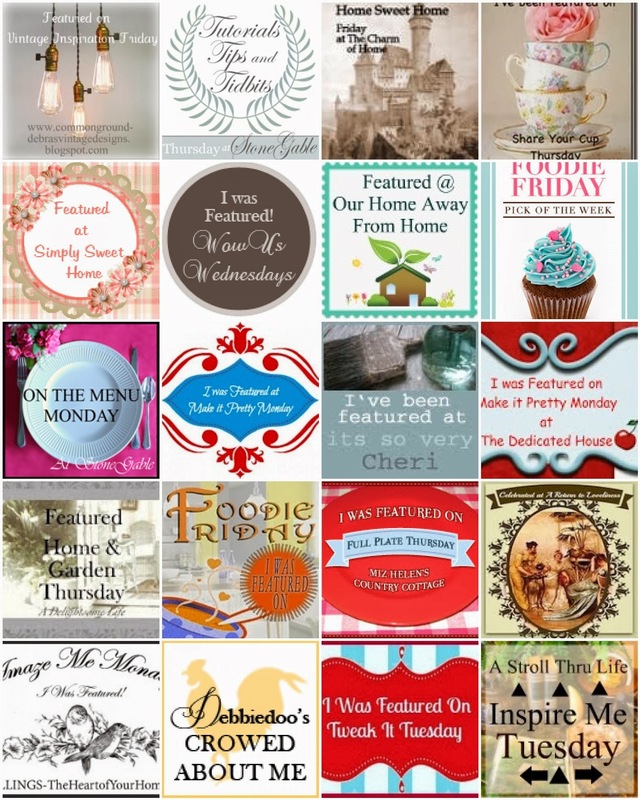 Please join all the fun and jump back to the fabulous blogs for more enjoyment. Lovely! The table looks so fresh and inviting. 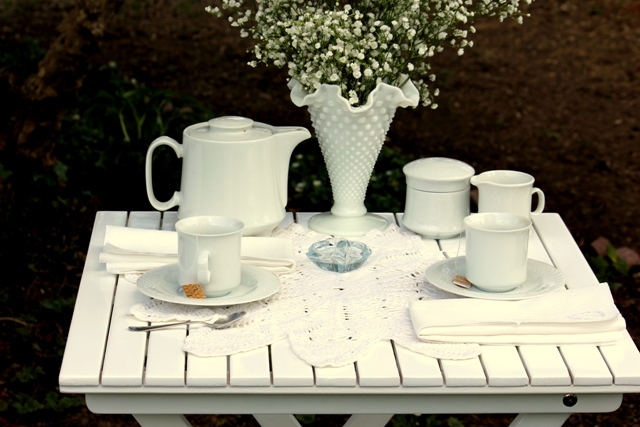 I love the milk glass centerpiece. 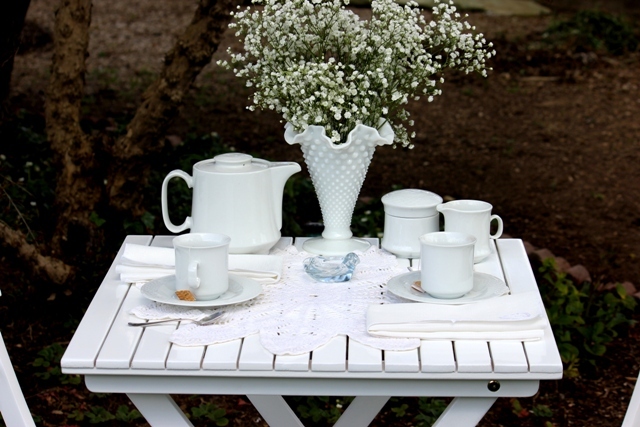 Your white tea is just lovely! It will be a few weeks I think before I can enjoy my tea outside. 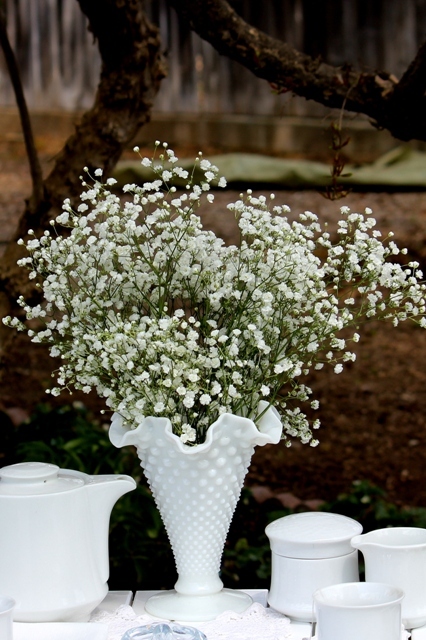 I love your white hobnail vase and I love the Baby's Breath! Those flowers are always right, aren't they? 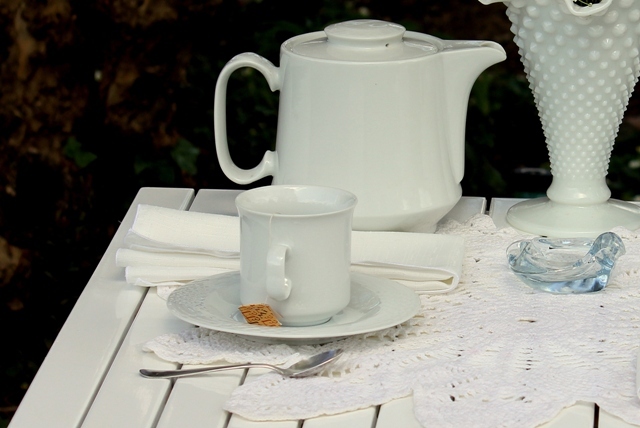 They're so delicate and feminine and they look wonderful with your pretty white tea set. Thank you for sharing today. 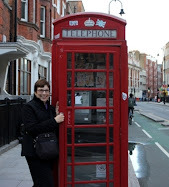 I've enjoyed my visit with you very much. Have a lovely day. How striking all your whites look against this beautiful background!! Stunning!! 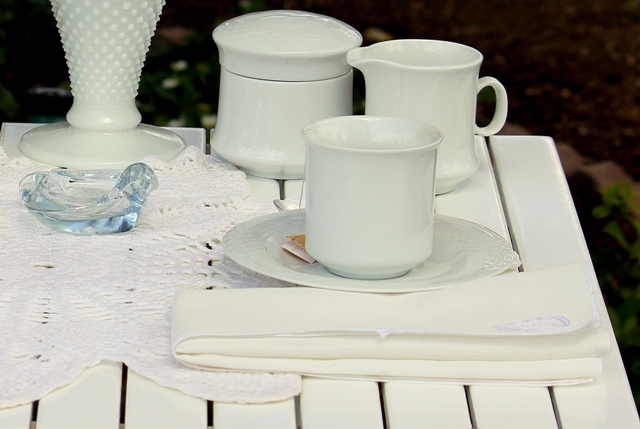 I really don't use white a lot in our house or garden; but it sure catches my "eye" in antique stores and on blogs. Perhaps I should display more white. The way you arranged things just makes everything look so inviting and simple and pure. Wowza!